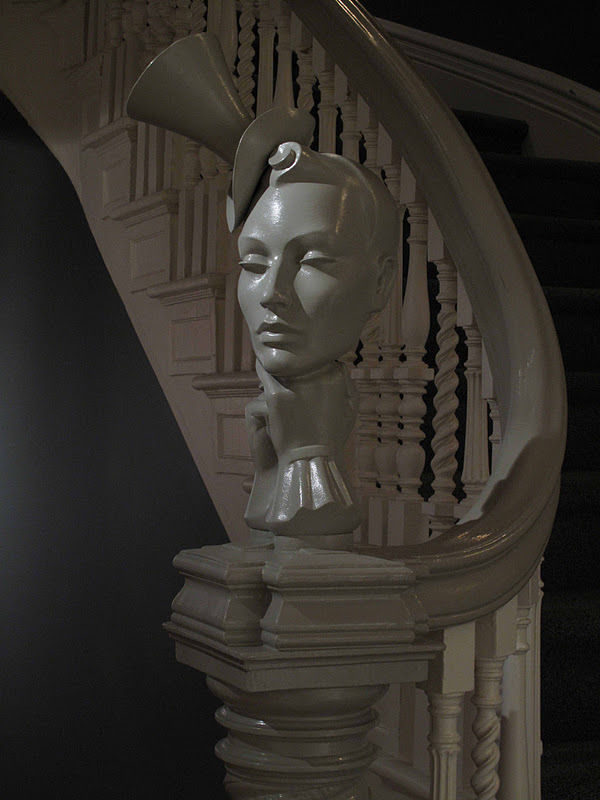 Hats: An Anthology by Stephen Jones: Newel post as you go upstairs to the exhibition. Waiting around for a lecture or panel discussion to begin is usually pretty boring. Last night was different. 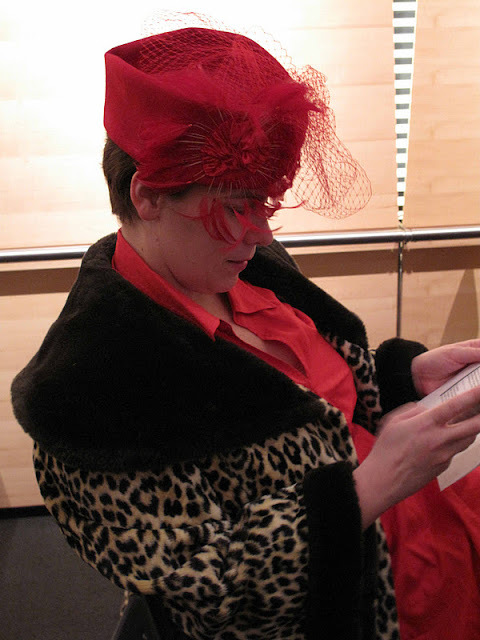 Almost everyone who came to the Bard Graduate Center was wearing a hat. Not just any hat, but a hat to remember. It turns out that although hats have gone out of fashion (at least in this country) there is a rarefied group of people that still make hats and wear them. They filled the room at Bard last night. What is the difference between a milliner and a hatter? A milliner makes one-of-a-kind hats and a hatter makes hats that can be reproduced. I don't look good in hats and therefore, I never wear them. I've always thought it was the shape of my face that was antithetical to wearing a hat. Last night changed my mind on this point. 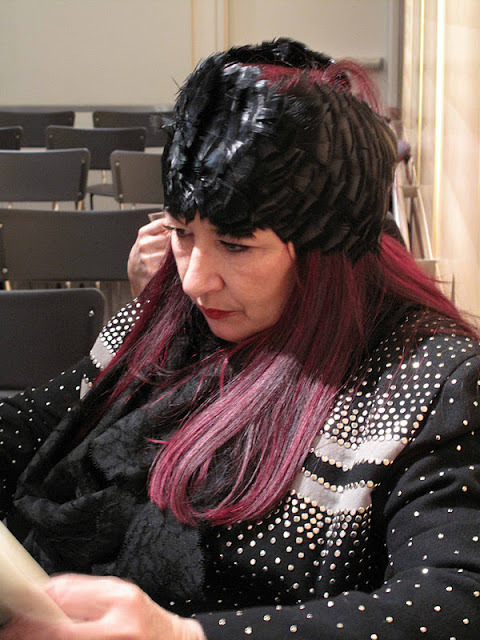 Lola Ehrlich: A hat is a fierce and dangerous accessory. When a woman puts on a hat, her personality is transformed. Like the perfect perfume or perfect mate; a hat is a seductive accessory. Choose your hat in proportion to your hips. Patricia Underwood: It's the frame: The theater: It's mysterious. When the hairdresser became more important, the hat became less important. In order to sell a hat, you need a salesperson. Stores don't want to devote a salesperson to selling hats. How many pairs of sunglasses can be placed in the same space as one hat? Albertus Swanepoel: My client is not hip or cool. They want something modern and wearable. I believe the best hat looks like it's been worn. It's part of you. A hat can enhance your attitude. The stars were aligned at this event: A moderator with good questions, 3 panelists with plenty to say, and an audience with the ultimate fashion accessory, a great hat. The last question of the evening: How do you feel about the baseball cap? Lola Ehrlich: It's unfortunate we are not in the baseball cap business. We would all be rich. All of the above photos by Peter Mauss. All photos are copyrighted. Please contact Phyllis Odessey for permission to use any of the above photographs. Everyone in the photos was sitting in the audience at Bard Graduate Center.